If you grow up in Europe or Russia you’ll probably have a very different viewpoint on alcohol than if you grow up in America. For all the freedoms in the Good Old US of A, drinking is still frowned upon. If you have more than 5 (12oz) beers in a session you’re a binge drinker. Really? 5 x 12 = 60oz which in the UK is 3 pints at lunchtime. Maybe not every lunchtime but when I was working in the UK drinking three beers at lunch was not unheard of, particularly on Fridays. On a few occasions over the last 22 years here I have been cut off from ordering another pint. Not because I was out of control, just because they felt I had drank too many drinks in a two hour period. 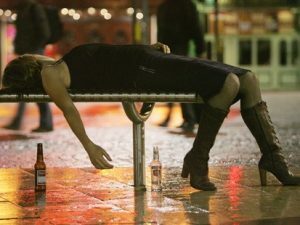 We have enough real issues in the world, without thinking we’re this awful Binge Drinker after just a few pints. Come on America “Binge Drinking” at three pints? Get real. Luckily I follow the Olde Country rules when it comes to drinking: if you can get to the bar to order a pint, you are fit enough to drink it! Rule, Britannia!